Lift Products Inc. expands the Max-Upender product line to offer many more options. The tilting of paper rolls, steel coils, or standard pallet loads of up to 8,000lbs is easily accomplished by the 90 degree tilt capacity of the Max-Upender. Available in standard platforms, U-cradles, split platform and custom platforms. For additional information, our toll free number is: 877-543-8776. 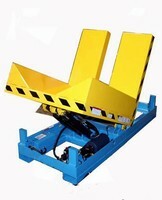 Our fax number is: 262-521-5725 or log onto www.liftproducts.com.